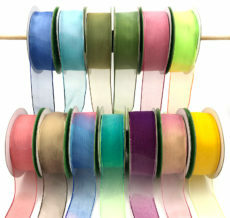 May Arts pearl ribbon is available in various styles. Add some fun to any gift wrap. Add an elegant touch to a gift basket or some sparkle to your Christmas project. There is something for any occasion: Easter, baby showers, weddings, & Mother’s Day just to name a few.